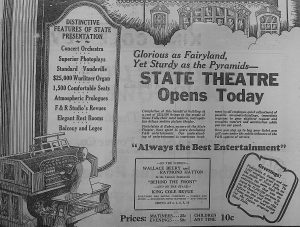 On opening night in 1926, patrons of the State Theatre were treated to the sounds of the Mighty Wurlitzer Organ at the hands of Jack Melerick and the State Concert Orchestra directed by C.H. Niles. A ‘Jazzy Revue’ of “King Cole” was the first program presented to the public. While there were other organs in town, they were primarily used for church and concerts. The State’s Wurlitzer was constructed and specifically designed for accompanying silent movies and to entertain theatre audiences. 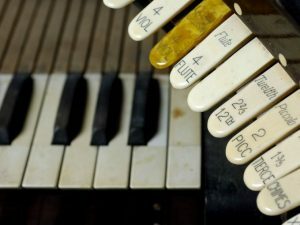 With its special effects device, often referred to as the “toy counter”, the Wurlitzer was able to include percussion and other sound effects such as train whistles and car horns to enhance the silent film programming. The organ has a total of 511 pipes, four tuned percussions, and 18 traps and effects. The Mighty Wurlitzer was always a crowd pleaser, and the management kept the organ in reasonable regular use through WWII and into the 1950s. In 1974 an organ enthusiast from Elk Lake, MN bought the organ from the theatre and planned to install the organ in his home, but he never got around to it. In 2005 the State Theatre Board contacted him and arranged plans to return the organ to its original home in Sioux Falls. The State Theatre’s Mighty Wurlitzer is currently in storage with the majority of its pipes and pieces. The restoration of the organ is very important to the State Theatre project, with less than 40 of these instruments in their original venues it is both our duty and a privilege to preserve this artifact from the “Golden-age” of entertainment. For more information on how you can give to The State Theatre, please click here https://siouxfallsstatetheatre.org/contribute/ or contact us at sfstatetheatreco.org or (605)-335-5757.